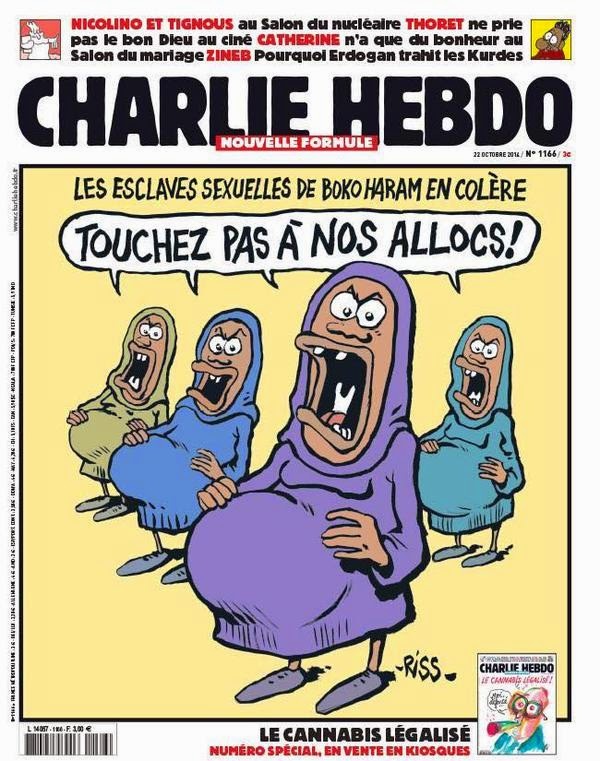 Under French law, the magazine could run cartoons mocking Islam, but it could not run cartoons mocking the Holocaust. AFP's Moscow editor Karim Talbi on memories of being an intern at Charlie Hebdo as a 20 year old. I knew for sure I wanted to be a journalist one morning in the autumn of 1996, after punching in the door code to a nondescript building near the Place d’Italie at the southern edge of Paris. When I wrote the post just below this one I'd forgotten that France has hate speech laws on the books, so claims of standing for freedom of speech are doubly absurd, and I hadn't seen many of the cartoons that the French protestors chanting "Je Sui Charlie" are familiar with. I wonder how many Simon Schama and Marks Ames have seen. Schama, like Tony Barber also in the FT, "Liberty and laughter will live on", and Ames on Twitter, "Swift was a racist. He *actually* wanted Irish poor to eat their own children." One of Charlie Hebdo's cartoonists was fired and taken to court for charges "inciting racial hated" for a comment on the news that Sarkozy fils was marrying a Jewish heiress and converting: "He'll go a long way in life, that little lad." 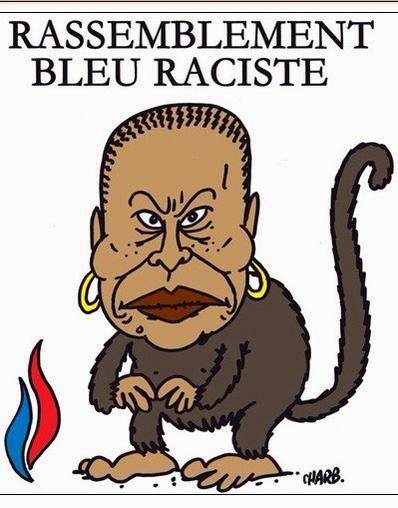 The case is as obscene as the joke, but no one was fired for the image on the left, of Justice Minister Christiane Taubira. Most of those defending Charlie Hebdo would not defend the right to speak of those they thought of as reactionaries, and that's a problem, for the marchers and for hate speech laws, because Charlie Hebdo is a racist hate sheet, and under hate speech laws on the powerful define hate. The liberal defense of Charlie Hebdo is not that it stands for freedom and liberty, but that it doesn't, and that liberalism defends the rights of bigots. Few of the marchers, and fewer of those mocking Barber and "the left" for betraying liberalism, seem to understand that, and that in defending not only the right to publish but the cartoons themselves, the self-righteous and self-described liberals are anything but. Their behavior is predicated on a liberalism of assumption, of rationalism and on faith: of reason, optimism and "self-reporting", rather than the liberalism of pessimism and law. That the marchers would defend hate speech regulations while marching for Charlie Hebdo is proof of their confusion. L: "Hands off our [welfare] checks!" 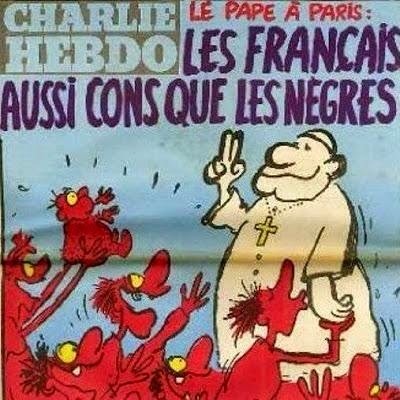 R: "The French are as dumb as the niggers"
The image with the Pope is from 1980, of John Paul II in France after a trip to Africa. 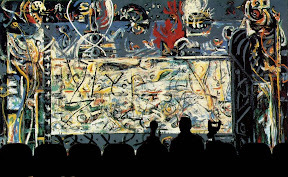 The words can be read as a thought bubble. I haven't heard or read a defense of the cartoon on the left above that didn't ring hollow.